This weeks challenge at Cute Card Thursday is to use something metal on your creations. I didn't do a card this time, I tried myself on a nice little box. Diese Woche sollen wir für die Cute Card Thursday challenge etwas Metallenes auf unseren Werken verwenden. Ich habe diesmal keine Karte gemacht, sondern mich an einer kleinen Box versucht. I used some of my new My Mind's Eye paper, which is of a really high quality and full of glitter, but seemed to be a bit too thick for all the scoring, so it teared on some parts... but never mind ;) I will try this with a bit lighter paper next time. Here is how I did the box. 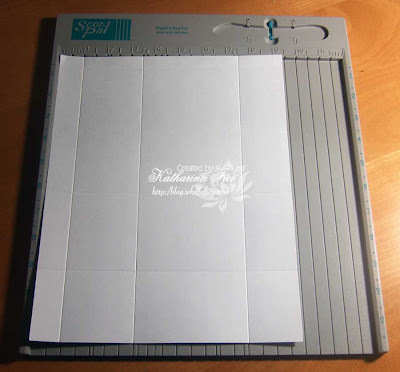 It is really easy and quick once you know the steps and you only need 1 piece of 12x12 paper. 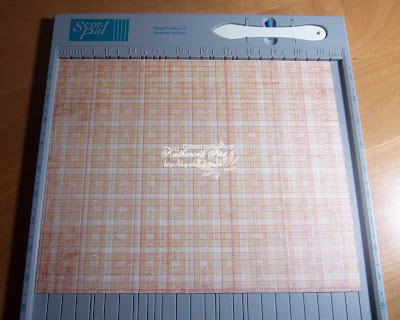 I started with a 11,5 x 9,5 '' piece of design paper and my Scor Pal. Hier zeige ich euch wie ich die Box gemacht habe. Es ist wirklich einfach und sehr schnell sobald man einmal die Schritte kennt und ihr braucht auch nur 1 12x12 Motivpapier dafür. 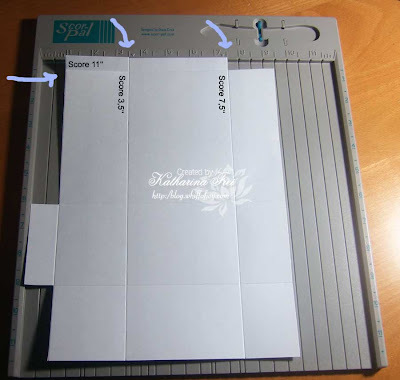 Turn the paperand score at 1'' - 3,5'' and 7,5''. 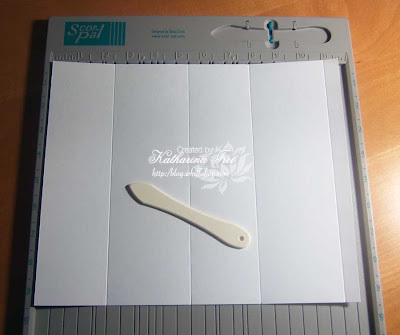 Dreht das Papier und falzt bei 1'' - 3,5'' and 7,5''. 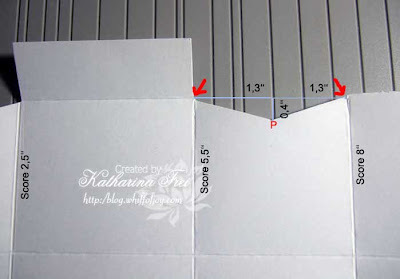 Take your scissors and cut away along Score 1'' down to Score 5,5'' and from the other side up to Score 2,5''. This way you will get a little flap. Jetzt schneidet ihr mit einer Schere entlang des 1'' Falz hinunter bis zum 5,5'' der langen Seite und von der anderen Richtung bis zum 2,5'' Falz. So erhaltet ihr eine kleine Lasche. Continue with carving from score 3,5'' to score 11''. Cut away along score 11'' to score 7,5''. Danach schneidet ihr den Falz bei 3,5'' ein bis zu Falz 11''. Und entlang Falz 11'' schneidet ihr das Stück bis zu Falz 7,5'' weg. Carve score 2,5'', 5,5'' and 8'' until score 7,5''. Scheidet Falz 2,5'', 5,5'' und 8'' bis zu Falz 7,5'' ein. The next step is a bit more complicated for me to explain, but I hope it will be understandable. It takes place in the 2 red ovals on the photo above. Der nächste Schritt ist ein wenig kompliziert zu erklären, ich hoffe ich bekomme es einigermaßen verschändlich hin ;) Es spielt sich alles in den 2 roten Ovalen im obigen Photo ab. The above picture shows a closer view. 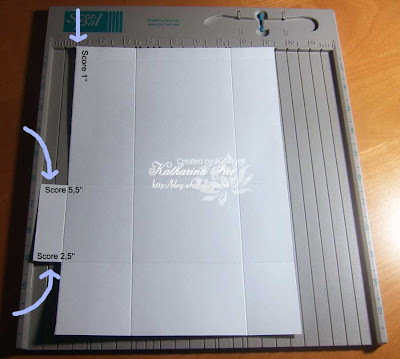 Scale the width of the rectangle between score 5,5'' and score 8''. It should be about 2,6''. Mark this point. Then measure 0,4'' down, also mark this point ( You should now be at the red P in the picture above). Cut from the edges marked with red arrows to the red P. That's it! Do the same on the left side of the flap. Das obige Photo zeigt einen größere Aufnahme. Meßt die Breite des Rechtecks zwischen Falz 5,5'' und 8''. Es sollte ca. 6,4 cm sein. Davon die Hälfte = 3,2cm. Diesen Punkt markiert ihr euch. Danach meßt ihr von diesem Punkt 1 cm nach unten und markiert den Punkt wieder. Ihr seid jetzt bei dem roten P. Nun müßt ihr nur mehr von den Ecken, die mit Pfeilen markiert sind zu dem roten P schneiden und fertig! Auf der anderen Seite der Lasche macht ihr das noch genau so. 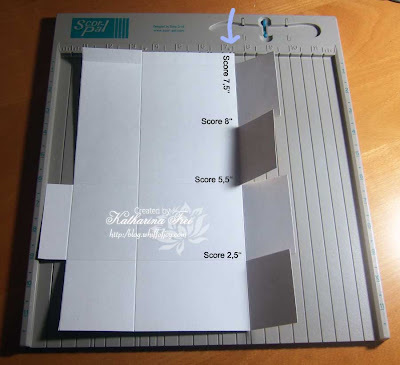 Turn your paper around and score at the side which will be on the outside of your box. Simply score from point P diagonal to Score 3,5''. Now you can fold the box and glue it together. 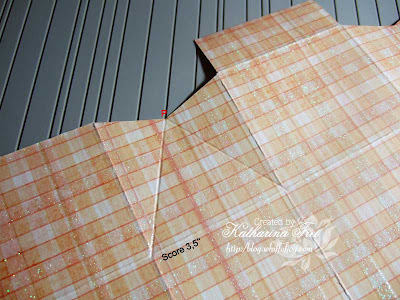 As a final step you might want to use a corner rounder on the large flap, because this way it is easier to slip it inside as closure. 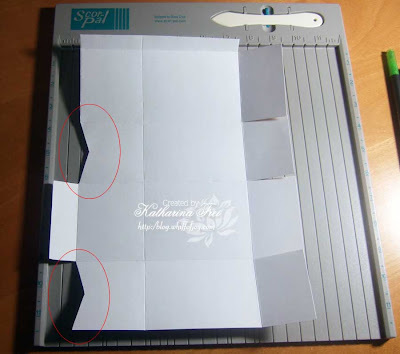 Dreht euer Papier nun um und falzt auf jener Seite, die dann die Aussenseite eurer Box sein wird. Ihr müßt einfach von dem Punkt P schräg bis zu Falz 3,5'' falzen und das auf beiden Seiten. Nun könnt ihr eure Box zusammenkleben. Als letzten Schritt solltet ihr mit einem Eckenrunder noch die Ecken der großen Verschlusslasche abrunden, damit sie leichter hineingleitet. Here is the finished project again. I hope you liked the tutorial! Hier ist das fertige Projekt nocheinmal. Ich hoffe das Tutorial hat euch gefallen, danke fürs Reinschaun! Danke für den Workshop, super erklärt und die Box ist einfach nur schön. great tutorial - love the box! Gorgeous box & thanks for the tutorial. 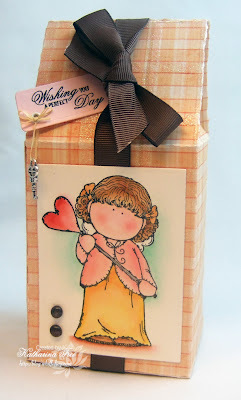 Fabulous tutorial and such a cute image, love it. Fab tutorial, I just had to give it a try straight away. Your pictures and instructions were just right and I made my box with no problems at all. Will let you know when I have decorated it up and put it on my blog. I love the box you made Katharina, it's beautiful. 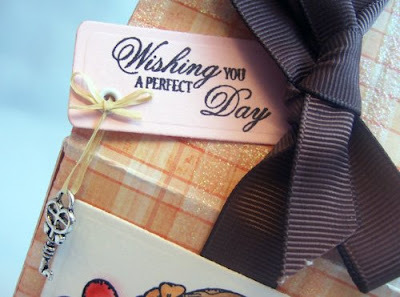 Love the sweet image you used and that big bow is just yummy..! Thanks for the fabulous tutorial! Wow so amazing! Very pretty and so creative! Really appreciate you taking the time and taking the pics and really giving the details step by step! Have poped a link over to your tutorial too for anyone wanting to have ago. Lovely box. Thx for the detailed tutorial. Your the best! I tried a score pal yesterday when I was at a craft evening, but couldn't really figure it out, have to try more next time! Glad the boys are better! Beautiful box Katharina, I love the Hanglar image, I too wish they were available to buy over here. Your tutorial is fantastic, so clear, I will be saving it and trying it out sometime, tfs! Thank you dear your tutorials are always so easy to follow, as Rach says wish we could get hold of this little darlings have been waiting sunce ugust but don't think they are going to appear in the UK anytime soon. I am off to haave a go at this little box. Thanks again dear and have a good weekend. Such an adorable box and thanks for the great tutorial, i'll have to try it out!! Thank you also for sponsoring our stamp something challenge this week, it should be a fun one!! have a great weekend!! Die Box sieht Klasse aus! Deine Box sieht super toll aus und der WS ist toll erklärt. 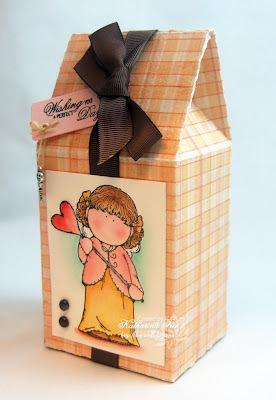 Fantastic tutorial, I have made the carton for a firends birthday, the instructions were so easy to follow, thank you!!! IF you would like to see the carton go to my blog All Glued Up!